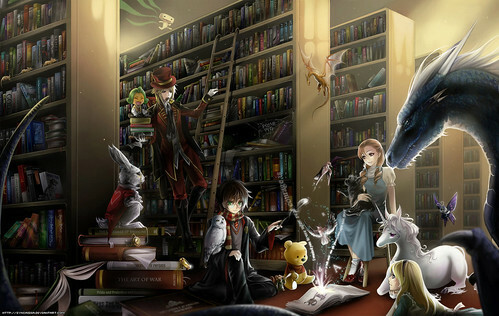 Book lovers will absolutely adore this amazing piece of artwork. How incredibly creative! This is pure genius. The amount of detail is mind-blowing… those are REAL covers! I spent a long time scrutinising it and had fun recognising all the books. It brought back a lot of memories. I love the message the artist was trying to convey. There is nothing more I’d rather do in the world than to lose myself in a good book, and step into the author’s world where the characters spring to life. I can spend hours with my nose in the book, and forget about everything else. p/s: Did you spot the Harry Potter books on the first bookcase, 2nd shelf from the bottom? I *love* this piece of artwork. I can’t remember how long ago I first saw it, but I go back periodically just to admire it. There’s so much detail! Let’s sneak ourselves in there and immerse ourself in that little world – it would be a long long time before I got bored in that picture! It’s been on my home computer desktop for months and months… I never get tired of looking at it and I’ve always noticed something new every single time, like suddenly recognising a book, or a new detail that I’d never spotted before.